Carter's - Changing Pad Cover Safari - All over jungle animal print in white, yellow, orange, green, light blue, aqua. Baby will love changing time with this soft plush Velboa Carter's Changing Pad Cover. The cover is made of 100% Polyester Velboa Bubble Dot fabric. The fully-elasticized cover offers a smooth, tailored fit with contoured changing pads measuring 16" x 32". Print Safari - All over animal print in white, green, grey, yellow, light blue, orange. 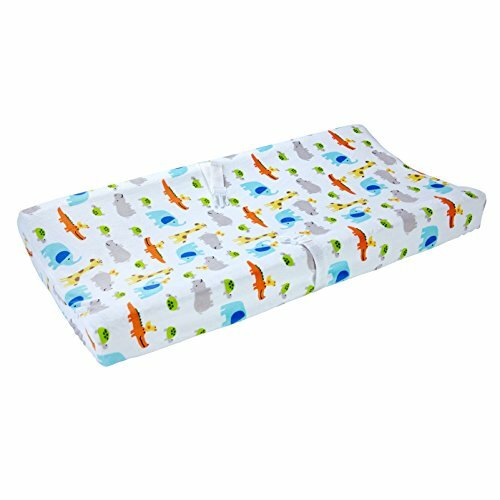 Fits a standard size contoured changing pad 32" x 16" x 4". Machine wash separately in cold water, gentle cycle. Use only non-chlorine bleach when needed. Tumble dry on low heat. Do Not Iron. Do not dry clean. View More In Changing & Dressing. If you have any questions about this product by Carter's, contact us by completing and submitting the form below. If you are looking for a specif part number, please include it with your message.